Getting in touch with nature is a fantastic way to destress, relax, and recharge your batteries. These days, there are numerous options for nature stays and you don’t have to “rough it” to enjoy a wonderful trip away from the city. Pitching a tent, fending for yourself, and worrying about insects is a thing of the past with the latest trend known as glamping. This exciting option is the Ritz of camping. Simply turn up and find a luxury tent or cabin waiting for you, allowing you to spend more time enjoying your trip and exploring the local nature. This craze is a fantastic option for taking your dog along as you will both enjoy a break in nature and have some wonderful bonding time. Glamping is a great alternative to dog friendly cottages, offering the best of both worlds, comfort of a structure and a taste of nature. While glamping has been around for a long time, it has only recently become a popular option for the masses. While camping involves bringing everything you will require to survive a few night sin nature, glamping provides all the essentials along with a whiff of luxury so you can spend less time setting up your camp and more time exploring the beautiful nature surrounding you. It is the perfect option for bringing your dog along as without the hassle associated with traditional camping, you will find more time for long walks and fun activities. Read my full guide on glamping over here! While traditional camping involves the panic of trying to remember to bring everything for the trip, glamping provides many items for you. 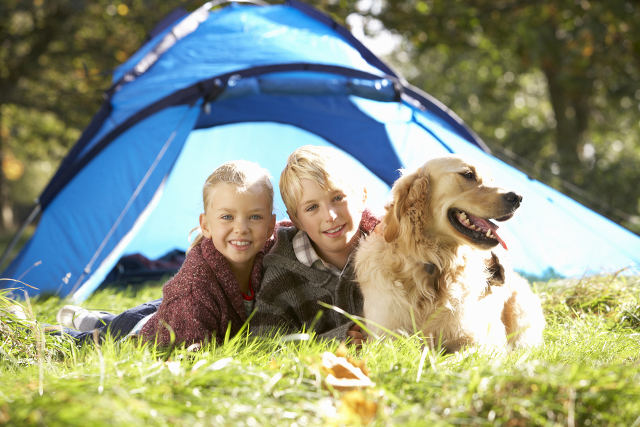 For example, camping with your dog means you not only have to remember the essentials for yourself, but also your pet’s treats, water bowl, food, and other necessities. However, many glamping sites cater wonderfully for dogs and as such provide all these essentials, allowing you to pack lighter and worry less. While many of these items may already be provided by the glamping site, it is worth double checking before heading to your glamping experience. Always obey leash laws in the area. Your dog is unfamiliar with the territory so using a leash is advisable even if there are no specific laws. Be aware of wildlife, especially if your dog has a taste for chasing rabbits, squirrels etc. Check the weather before embarking on a long hike. During the summer, ensure you have plenty of water for your dog and during the winter ensure you have everything needed for your dog to be comfortable (blanket etc.). Clean up after your dog. While it may be alright to allow your dog to do their business in the open forest, ensure you clean up after your dog on the glamping site.